balofo wrote: -1/100 Gusion description says it comes with parts for 2 not yet revealed weapons and more hidden gimmicks. Maybe the shoulder armor double as knuckle guards but I have no idea for the other hidden gimmicks. Its firearm is called submachinegun here. So between everything we've seen including Option Set 3 it's got a handheld SMG, head vulcans, some sort of torso-mounted weapons (more machine guns? ), the 'Gusion Chopper', 'Gusion Hammer' and 'Gusion Axe' and that's still not everything?! Wow. yeah the description mentions it's fully loaded of play value. Its price is double of the 1/100 Barbatos&Graze ones. I'm starting to believe it either can cast off its armor or at least the legs unfold to the normal Gundam Frame size. I really would love a cast armor ability. I go crazy for that kind of stuff. That broad sword for the Graze just made my day. So, we've got the silhouettes for the upgraded Graze Kai, and that new unknown MS that we have already scene a rough mock up of. We also still have that completely unknown and unseen MS (that is possibly an upgraded Barbatos or a new gundam-type) and then we have something rather curious: the 'MS C', which appears to just be the Gundam frame used for the Barbatos. It sits at a higher price point than even the base Barbatos kit, so we can reasonably assume that it isn't just the frame, but we must also wonder if maybe they are just using that silhouette as a stand in. But then why use a stand in for a teaser silhouette? Seems kind of strange. -Gundam Barbatos: Currently, 26 machines including the Barbatos have also been confirmed to remain in existence; its rarity can be said to be extremely high. Because it's a MS from the previous era, when Mikazuki Augus first boarded it the armor and such were also in a peeling off state, however by Teiwaz technicians it recovered the form from 300 years ago. -Ahab Reactor: it received an overhaul maintenance by Teiwaz technicians, reactor output improved. The 2 Ahab Reactors' rate of operation increased, Barbatos' original performance was approached. To Mikazaki Augus who pilots through the medium of the Alaya Vijnana System, reaching the point that a behavior closer to one's senses is reproducible. -Backpack arm: extremely flexible structure that has been adopted for armament attachment. It's possible to equip armaments regardless of them being exclusive use, the smoothbore gun for example is used while mounted. -Long Sword: grip for the long sword that has been adopted to match the Barbatos' manipulators. It was improved in order to keep kinetic energy loss to a minimum. -Smoothbore Gun: Smoothbore Gun's caliber: 300mm. Machinegun attached to the Smoothbore Gun's caliber: 60mm. That's what I'm guessing. Or maybe perhaps it's another Barbatos kit, but this time with all its weapons/ parts taken from other mobile suits. The latter might be unreasonable, but I wouldn't put it past Bandai. 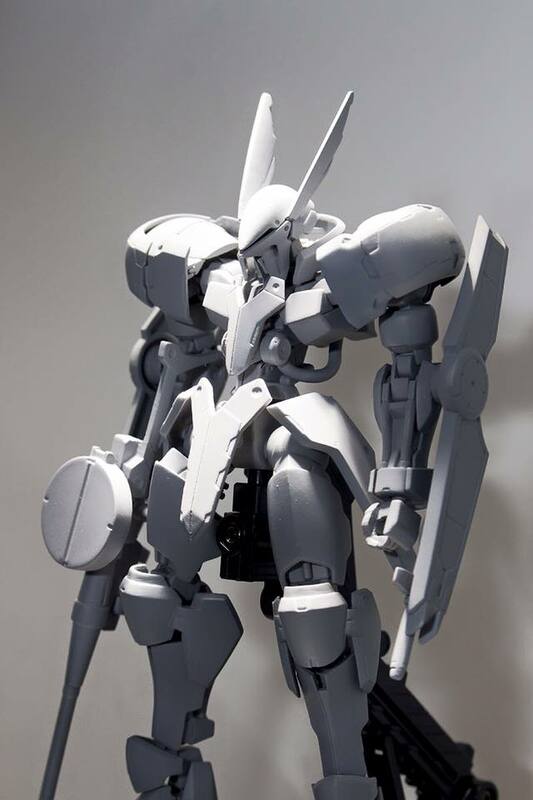 Preliminary info on Amida's Hyakuren: it's a part of the first 9 machines produced called Single Numbers and it has better performance than the general Hyakuren. to me the MS-C is a fix gundam frame like the shoulder suspension im exited. If MS C was just the Gundam Frame there would be no reason to hide it. The silhouette pic is exactly like the Gundam Frame lineart available. Anyway Gusion is confirmed to have an overall height of around 18m, same as Barbatos. It seems to me MS D arm shields can rotate like the Flag's Defense Rods. what im trying to say is my prediction of the unknown MS and the face of MS-d,the gundam frame RG style its for six form barbatos. I highly doubt the ms-b is a second form of gusion. My bet is going for a Barbatos upgrade but it could also be a new Gundam. Does anyone know how many forms Barbatos has throughout the whole season? Eclipse36 wrote: Does anyone know how many forms Barbatos has throughout the whole season? There have been four so far. Form 1 is equipped with the mace in the bracer. Form 2 is equipped with the Graze shoulder armor, and the smoothbore cannon. Form 3 is equipped with the Graze shoulders, the Schwalbe Graze grappling claw, and the mace, I believe. Form 4 is the Teiwaz upgrade with the Barbatos's original shoulders and the sword. It bother's me that they are referred to as different 'forms', when they are really just different equipment loadouts, but oh well. Yeah I've been aware of those four and with that ms-c silhouette being called form six that's confirmation of there being six forms so far. I agree though I dont know why theyre called forms when one or two small things have changed.Like changing shoulder armor isn't much. Or leaving everything alone and just adding something to the forearm is hardly anything. We don't know for sure whether that is Barbatos yet though, even if it looks like it. I think the only change from Form 2 to 3 is that Barbatos' Gauntlet is substituted for the Schwalbe grappling hook. Also, form as a word may refer to a specific configuration. Last edited by SonicSP on Sat Dec 05, 2015 3:34 am, edited 1 time in total. SonicSP wrote: We don't know for sure whether that is Barbatos yet though, even if it looks like it. Also, form as a word may refer to configurations so it fits. Was the Barbatos name actually mentioned there though in the source material or did they just say MS-C and MS-D (because HG 1/144 MS-C/D is all I can gather from a quick look)? I mean it probabaly is Barbatos given the extreme similarity to the Gundam Frame lineart, which we know but the kit hasn't been officially confirmed as Barbatos yet.